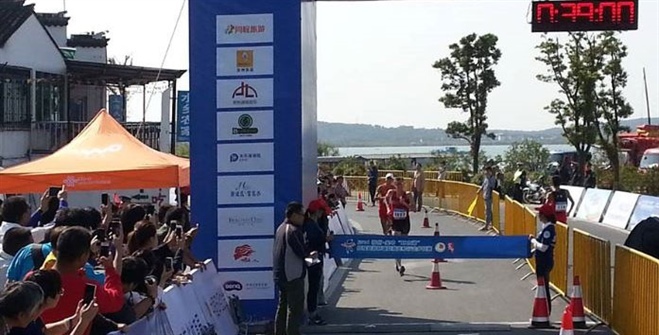 Australian race walker Dane Bird-Smith (Qld) has finished second at the Suzhou ‘Lake Taihu’ tournament in China. In a field of 80 world ranked walkers, Bird-Smith finishing only 34 seconds behind the 20km Chinese gold medallist at the London Olympics and silver medallist at the 2013 IAAF World Championships, Ding Chen. The multi-day international tournament of Race Walking is held over four days with each race on a different course over distances 11.7, 12, 10 and 15.7 km. Held in the area of Lake Taihu, in the Wuzhong District in the City of Suzhou, China, the contest has been described like a Tour de France in that it is run over consecutive days on the road, the courses change each day and the finishing times for each stage are calculated to determine who will wear the yellow jersey into the next stage. It has attracted more than 300 domestic and foreign professional athletes to the start line and behind that were 14,000 entrants for public races.